« Memory Jogger: Case Insensitve and “Like” MySQL queries. NME recently released their picks for “Top Albums of 2010″ but unlike previous years it no longer seemed to be a who’s who of my personal favorites for the year. Previously my likes have often matched NME’s end of year picks extremely closely but this year I was slightly underwhelmed with the selection. So I began to wonder, had music changed a lot this year, was I getting older and staying stuck in my ways while NME adapted and changed to the latest music scene. I was curious to find out so I put together a Flash interactive that visualizes the music genres represented each year in the NME Top Album chart and hopefully show how they have changed. I started by grabbing a copy of all the NME charts for Top Albums from the very useful Rock Lists website here: http://www.rocklistmusic.co.uk/nmeindex.html. Luckily he had detailed lists going back to NME’s first chart from way back in 1974. The next step was to assign the appropriate musical genres to each of the albums. I realized that this in itself is something that could be open to lots of interpretative “debate” so I settled on the idea of using Wikipedia to settle the argument. So for each album I data mined the genre or genres either associated to the specific album’s wiki page, or if the album didn’t have a page than I used the genre or genres associated to the artist’s wiki page. If neither artist or album had a listing than I didn’t associate any genres to it. Once this was done I decided I would use a circular bubble chart to plot the music genres for each year. 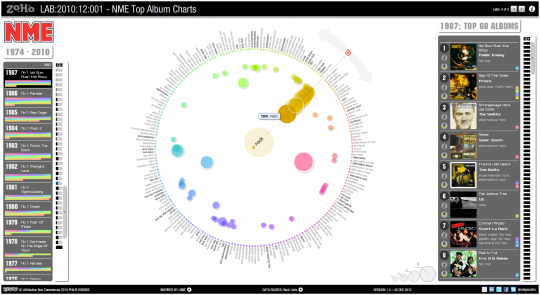 The size of the bubble would represent the number of times that genre had been associated to an album and the proximity to the middle would represent the weighting of the genre within the charts picks. For the weighting I came up with a formula that would not only take into account the performance of each genre’s albums for that year but would also compare the performance across all years. So for instance the best performance of any music genre was “Rock” in 1974 with a count of 27/60 and a ranking of 91%. 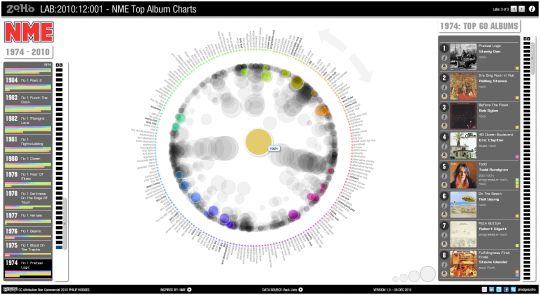 The visualisation seems to imply that the charts have become more diverse each year, representing more genres in total. The period of time where the chart and my tastes converged, the results where strongly influenced by Indie Rock, Alternative Rock and Post-punk Revival. This year Indie rock still charts well but with Art Rock and Experimental being the next two dominate genres. The Alternative Rock and Post-Punk revival that I love so much is way down. 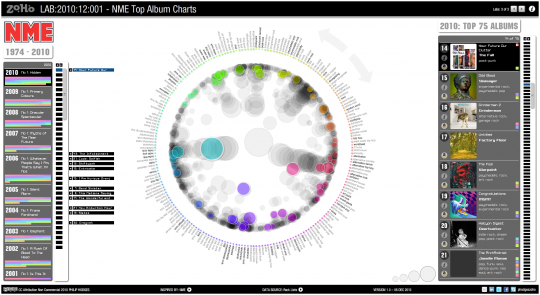 Some other features include selecting an album to see a listing of other albums by the same artists and selecting a genre to see a bar chart of the genre’s count across years as well as a filtered view of the bubble chart to see that genre’s history. I have also included the Wikipedia link where they exist and also just for the fun of doing it (never done one before) I have also set up Amazon affiliate links for each album. However I don’t expect to retire anytime soon off the proceeds. I love “best of the year” charts and this was a lot of fun putting together. This entry was posted in Data Visualisation, Interactive Data, Lab Examples and tagged Actionscript, Adobe Flash, Data Visualisation, flash, Infographics, Interaction, Interactive, Interactive Data, NME, Statistics, Top Album Chart, UX/UI Design, Visualizations. Bookmark the permalink. Post a comment or leave a trackback: Trackback URL.